From camera-mounted sunglasses that failed to be welcomed in any social setting, to Bitmoji's creepy cartoon depictions of reality, it seems like Snapchat's parent company - Snap has tried it all to stay relevant. 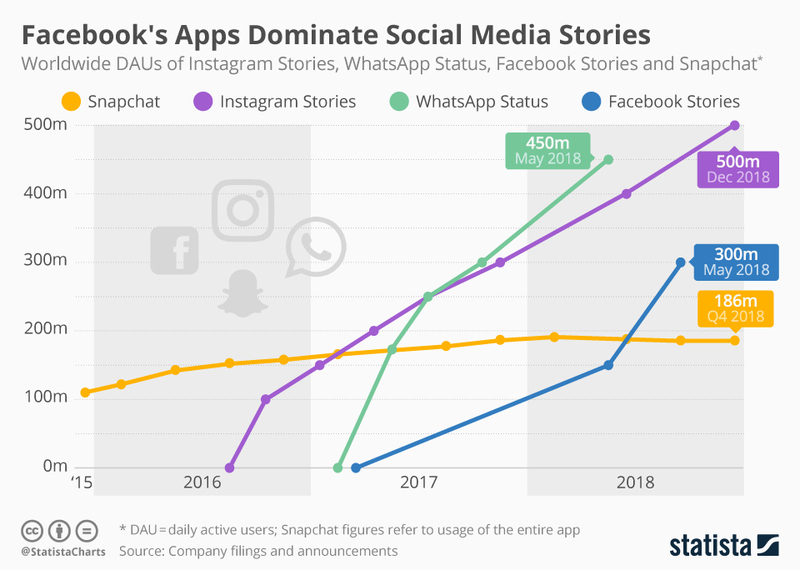 Especially, when Zuckerberg's army of clones - boasting an impressive 1 billion daily story users vs Snap's 186 million, threatens the story-based core social media model of the app,. Well, it seems Snap has yet to be snapped. At its recent partner summit, the social media company announced its launching StoryKit - a plan to allow apps like Tinder the ability to embed Snapchat stories into their app. The incentive being enhanced engagement and security for the partnering app, whilst Snap additionally benefit from the data they gather from users using their native camera. Quite the colonization strategy you might say. Then again, with the day-to-day data privacy-exploitation headlines streaming from Facebook HQ, it's a no-brainer that advertisers, content creators, and businesses alike are looking to alternatives such as Snap to save them from being victims in the Facebook apocalypse. As the human world becomes more digital, our connections and interactions are recorded and shared. We go from knowing 150 people and analyzing a few stories a week to 2 billion people sharing hundreds of millions of stories constantly. But humans still need to understand what's going on underneath. In this entry, we want to highlight how massive, machine scale systems are visualized through mathematical methods to tell new stories. These charts -- giant sprawling data webs like airplane traffic patterns etched onto the globe -- are the future of literacy in the machine age. In the first example, we borrow two images from Google. The Google Cloud team created a service which grabs the entire Ethereum blockchain, backs it up on Cloud, and makes it easier to analyze. The first image shows the Crypto Kitty universe, with color attached to owner of the contract (kitty whales!) and size of the bubble ranking the quality of the asset. We can certainly imagine this done on regular old financial assets. 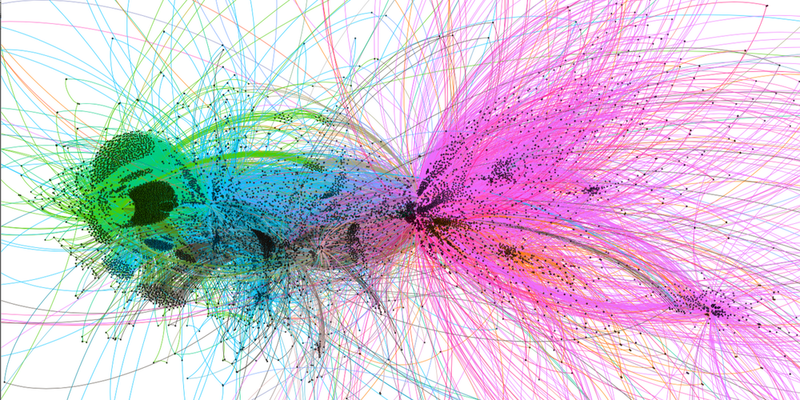 The second visualization is for transactions: points are wallets and lines are asset movement. You can immediately seen wallet clustering, which shows entities that have more frequent transactions between each other closer together. In this way, one can ferret out exchange wallets or bots. Hey there Bitfinex! The second source is a ConsenSys write up on decentralized exchanges, and is truly a spectacular chart. Do yourself a favor and click to zoom in. The dataset comes from IDEX, EtherDelta, Bancor, 0x, OasisDex, Kyber Network, and Airswap Protocol -- today's decentralized exchanges. Each point is a trading pair, the width of the line is number of normalized trades, and the line colors signify the exchange used. You can immediately see the most popular trade contracts, as well as exchanges where trading hops through an intermediate token, rather than through ETH itself. We'd love to see this for traditional FX markets, or maybe all trading period! The last chart is from Geoff Golberg, who mapped out all Twitter accounts engaged in the Ripple XRP community with the purpose of identifying bots. And yep, the 40,000 point cloud has multiple bot armies across the world used to manufacture opinions and drive social engagement. It takes a robust mathematical approach to visualize this information, and a detailed article written by a human to infer the relationships and their activities within the data network. This is a flavor of future skillsets required to thrive in a machine world. FINTECH: Facebook's Faustian Banking Bargain. Here's a Trojan horse if we've ever seen one. You probably already know that Facebook would like to get its paws on some banking data. The social network giant approached several of the largest global banks -- JPMorgan Chase, Citigroup, Wells Fargo, and US Bancorp -- to get financial pipes that map onto its users. Such financial data would then be integrated into Facebook Messenger, and not sold to advertisers according to the company. Putting aside issues of Cambridge Analytica and other various public trust mistakes, Facebook is clearly asking the banks to disintermediate themselves by shifting the primary consumer interaction from bank apps to its Messenger. This is a particularly Faustian bargain. Facebook is already integrated into payments via Mastercard, American Express, and PayPal. It is of course exploring blockchain, and effort led by the former president of PayPal. In a recent review of P2P payments providers, Facebook lagged behind Apple Pay, Venmo and Square, but was ahead of Zelle, the banks consortium. It is experimenting with Whatsapp as a payment rail in India. Looking at a report of recent patent filings for banks, in every category including transaction processing, mobile banking, e-commerce and payments, the tech companies (e.g., IBM, Google, Microsoft) hold more intellectual property than the banks. So giving Facebook customer financial data not only hands over the customer, but puts that customer into a far better technology platform. Which gets us to the following -- why doesn't Facebook just buy the data with customer permission? In Europe, PSD2 has forced large banks to open up all their data via APIs. In the US, Yodlee (under Envestnet), ByAllAccounts (under Morningstar), Quovo, Plaid and many others offer account aggregation as a service across thousands of banks. These are stable, proven products used by many financial institutions. Oh wait -- Yodlee costs at minimum $0.40 per user per month. For 214 million American Facebook users, that would add up to about $1 billion of cost. We get it. Facebook wants to offer the Faustian bargain, and they want it for free.